Neighborhood in Brief: Located on Chicago’s affluent Near North Side--just north of the Chicago River--the River North business and residential area has come a long way from its shady beginnings as a notorious red light district. Now home to some of the city’s trendiest art galleries, hotels, bars and restaurants, it attracts well-heeled locals and visitors alike. It’s also home to several well-known landmarks, including the Merchandise Mart, which once belonged to the Kennedy family. River North is adjacent to the Gold Coast, which is just to its north, the Magnificent Mile shopping district, which is just to the east, and the Loop, Chicago's business district, which is just south past the Chicago River. The Gwen in Brief: The luxury boutique property opened in the landmark McGraw-Hill Building in 2015. It's adjacent to Shops at North Bridge, which boasts retail powerhouse Nordstrom as its anchor. There are 312 rooms and suites. Several rooms offers premium views of Chicago landmarks such as the Magnificent Mile shopping district, John Hancock Building and more. Amenities: There's a 24-hour gym and business center, plus guests may request in-room massages and mixology cart services. 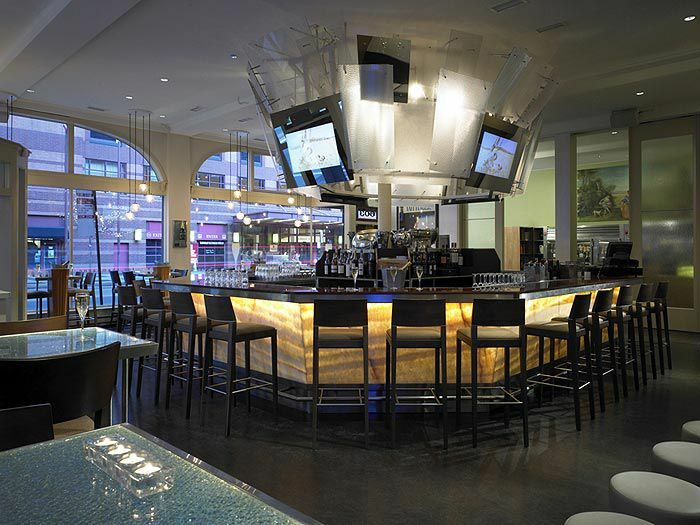 For dining and drinking, there are Circa Restaurant and Lounge and Upstairs at The Gwen. Room Rates: Rooms range $117-$520 a night. Book reservations right here. Parking: Street parking is available, but scarce. The hotel offers 24 hour valet parking. Acme Hotel Co. The chic boutique hotel offers comfort, rock ‘n’ roll style and affordable prices. Owned and operated by a Chicago-based development group, ACME targets those budget-conscious types looking for the type of amenities typically featured at local luxury properties. ACME houses two eating and drinking venues: The Berkshire Room, a craft cocktail lounge, and West Town Bakery, a chef-driven eatery that’s on our Best Chicago Pastry & Dessert Shops list. The bakery even carries its own version of the popular Cronut, and it’s available in several varieties. Conrad Chicago. The third version of Conrad Chicago is 20 levels high. It's a lot more luxurious than its predecessors, boasting a number of high-tech amenities such as a virtual concierge and "smart" guest rooms. Celebrity chef Richard Sandoval is behind the three restaurants: Baptiste & Bottle, Il Tavolino and Noyane (slated to open summer 2017). Freehand Hotel. In part a hip hostel, Freeland aims to attract Millenials with budget-friendly shared rooms as well as private rooms serving business-minded and leisure travelers. The bunk rooms have four lockers for guests to store valuables, a bathroom and a small sitting room. Private rooms have standard features, and all guests get complimentary wifi and breakfast. James Chicago. Designed to combine both contemporary and cutting edge architecture and design while keeping the atmosphere hospitable and homey, the James offers guestrooms with platform beds and large, slate-tiled and marbled bathrooms. Two penthouses are available for those wanting to experience true urban luxury and views. David Burke Steakhouse is on the first level. Bavette’s Bar & Boeuf in Brief: This French-inspired steakhouse based in River North is certainly a special place. From its intriguing basement lounge to the very date-friendly vibe of the main dining room, Bavette's is in a class by itself. While the upstairs setting can be a bit intense at times, the lower level feels like a funky den where music varies from Parisian-focused house and acid jazz to old-school hip-hop. Menu favorites include a 22-ounce, bone-in, dry-aged ribeye; shellfish towers of oysters, jumbo shrimp and lobster; buttermilk fried chicken; and shortrib Stroganoff with hand-cut fettuccine and cremini mushroom. GT Fish & Oyster. Helmed by star chef Giuseppe Tentori, this fashionable fishhouse delivers on its promise of superior food and drink choices. The most coveted seats in the house are at the raw bar, where guests may indulge in freshly shucked oysters. Shaw’s Crab House. One of our favorite child-friendly destinations, Shaw's is also a popular after-work hangout for adults because of the Oyster Bar, which showcases live blues and jazz several nights a week. The restaurant aggressively offers seasonal shellfish and other seafood as well as sushi. RPM Steak. A celebrity magnet, RPM Steak showcases a dazzling, glamorous dining room where you can see what's going on in every corner of the room. Its claim to fame are the juicy, grass-fed steaks and bison. Tanta. Famed Peruvian chef Gaston Acurio is behind this fine dining establishment. In addition to street food-inspired cuisine, ceviche and specialty Peruvian dishes, the restaurant offers a unique pisco spirit program. Guests may order signature pisco cocktails on tap, or a flight of infused pisco tastings. Pops for Champagne in Brief: Considered to be the country’s first-ever champagne lounge, Pops is in its second location and still going strong after more than 30 years in business. The more than 200 selections of bubbly are meant to pair with chef-driven dishes such as charcuterie, caviar, oysters and cheese. There’s also live jazz regularly, so the target audience is a mature crowd. They've transformed the downstairs bar into Watershed, a cocktail lounge specializing in spirits from the Great Lakes region and craft beer. The Broken Shaker. Located on the lobby level of Freehand Chicago, The Broken Shaker showcases Polynesian-inspired specialty drinks and share-able plates. The crowd's a great mix of locals, bar industry types and visitors. There's a lot of fun aspect to this menu, from the daily punch offering to "Pick-Nick Service"--The Broken Shaker's version of bottle service. Headquarters River North. The bi-level cocktail lounge and eatery showcases retro and contemporary arcade games in a swanky setting. The menu falls in line, featuring familiar dishes and drinks inspired by 1980s and 1990s pop culture. Three Dots and a Dash. The upscale Polynesian pub re-invents everything from the Beachcomber to the Zombie. Guests walk through a lit-up alley on Hubbard Street and head downstairs for the action, which includes female servers in hula skirts, a lively crowd and music ranging from 1960s surfer tunes to old-school hip-hop. Underground Wonder Bar in Brief: Another late-night venue, but this one specializes in spotlighting home-grown artists. Passionate blues, jazz, reggae and Latin performers have made Underground Wonder Bar a must-do stop for many famous visiting musicians, including the likes of the Stones and David Byrne. Ikram in Brief: The luxury women’s boutique moved from its long-time Rush Street digs for a larger space in River North. That made more room for them to create Ikram Café, an elegant lunch destination that feels more like an exclusive ladies’ lounge. Chef-driven, yet dainty sandwiches, salads and wraps along with a limited wine list are the specialties.